I went to Mariefred on my second weekend in Sweden to open an art exhibit at Grafikens Hus. It was one of the last weekends of the summer and this beautiful little town was packed with tourists, mostly Swedish, enjoying a good time in the small streets by the river or on the grounds of Gripsholms Slott. Not that many people came to the art exhibit that day. Before going back to Stockholm, my Swedish host drove around the streets of Mariefred and I knew I would come back before winter. When I woke up this morning I decided today was the day I would go back to Mariefred. I finally had a car and I had bought a GPS so I wouldn’t get lost trying to get out of Stockholm. As I was about to leave, I got an sms from my friend Ryan who, for some reasons, happened to be on my island (Södermalm) on this early Sunday morning. When I told him I was going to Mariefred he thought I meant Marie Laveau (a famous bar in Södermalm, also known for its breakfast on weekends). He didn’t realize what he was getting into when he asked if he could join me! After a light lunch at Grafikens Hus (reindeer meatballs with macaroni because they just went out of potatoes), we undertook to explore the city. Mariefred is a beautiful but small city! It wouldn’t take too much time. And at this time of the year – and with a little bit of rain today – my main objective was to try a coffee shop outside Stockholm! Mariefred might be small but it has a few nice coffeeshops. As I was walking in the city, I first saw the sign! But I am not that easy. I was not going to walk into the first coffeeshop I see. 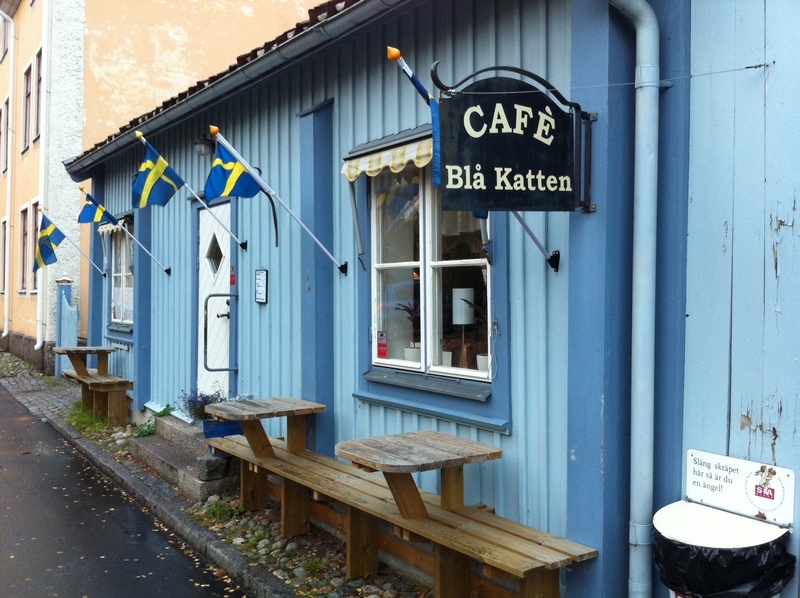 So I kept walking and I saw a few other nice cafes but when I walked in front of the Blå Katten, it was decided. The flags. The blue. The yellow. This is where I would have my Mariefred coffee experience. It is the low season in Mariefred and the cafe was pretty much empty when I waked in. But within a few minutes we were joined by a few people, including – quelle surprise – a couple with a young baby! So the baby thing is a Sweden thing, not only in Stockholm! 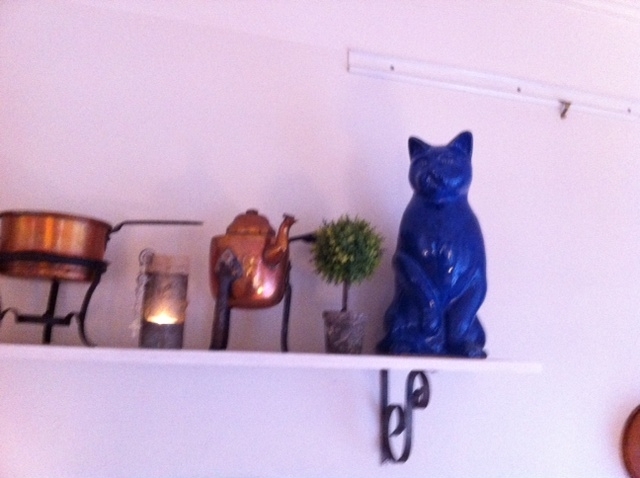 There are many blue cats at Blå Katten. That makes sense. It is Sunday. 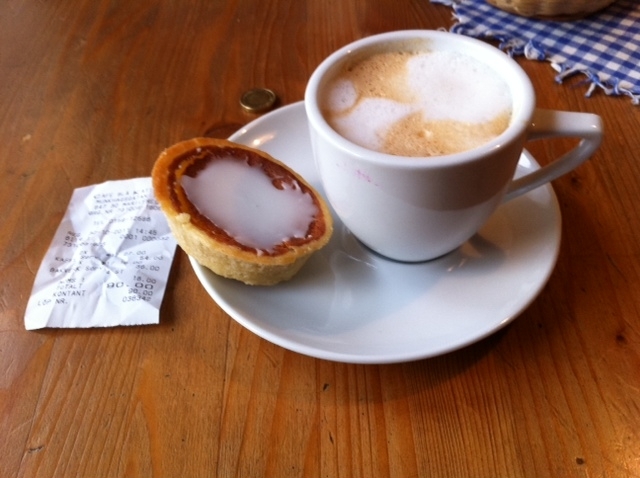 I am happy to be in Mariefred, so I just turned to cup on the other side and I enjoyed my coffee. And I look forward to coming to Mariefred. 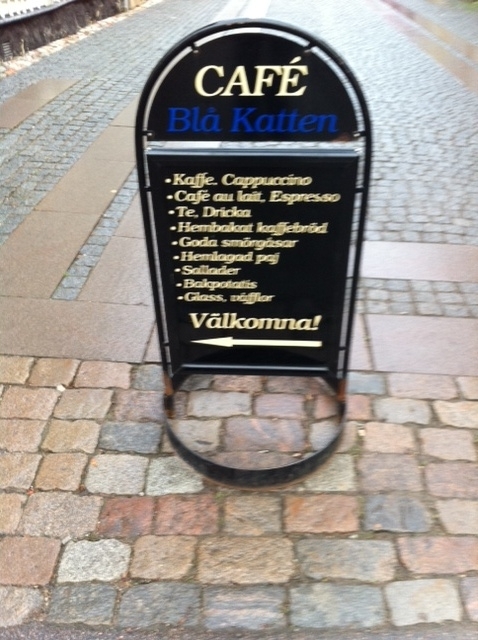 Next time I will spend more time so that I can enjoy the Blå Katten and other coffee shops in town!